Four solos from my “More than 64 solos for solo horn, opus 139” were chosen to comply with the requirement of the University of Regina to have accompanied works performed for juries. 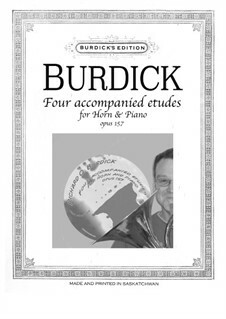 It is my requirement that the first year of university studies for horn major be an emphasis on etudes. To fit my objectives and the Universities requirement, here we have this work. The only difference in the horn part from the solos of opus 139 is that in #54, the hornist must hold the last tone an extra measure. These piano parts were written primarily on the RSO’s run-out to Assinboya Saskatchewan February 3rd 2009.